Danny Lipford preparing a home for fall. Fall is just around the corner, which means winter isn’t far behind. This is the perfect time of year to make sure your house is energy efficient and ready for the cold weather ahead. That includes buttoning up your house up to lower your winter heating bills, maximizing the efficiency of your heating system, and making sure your house is safe from fires. The first step to improving the energy efficiency of your home is to draftproof your house by finding and sealing any air leaks, especially those around windows and doors. Start by closing all your doors and windows, turning off the heating/cooling system, and turning on any exhaust fans—such as range hoods and bath vent fans—to create an artificial draft in your home. Light a stick of incense and pass it slowly around the edges of windows and doors. Watch for movement of the smoke—indicating drafts—and mark the spots with pieces of painter’s tape. Examine the weatherstripping where drafts were found, and adjust or replace any that is worn, bent, or damaged. To seal gaps in the threshold at the bottom of doors, install Duck® brand Double Draft Seal or Triple Draft Seal. Duck brand Double Draft Seal for doors. To reduce the amount of cold air coming through the glass on older single-pane windows, apply a plastic film kit—such as Duck® brand Roll-On Window Insulation Kits—over the window. Folding attic stairs can also be a major source of heat loss during the winter. Start by applying self-adhesive foam weatherstripping between the pull down stairs and the frame, then position a Duck® brand Attic Stairway Cover in the attic over the opening. Go to Duck Weatherization Solutions for more home energy saving tips and products. Whether your heating system uses gas, oil, or electricity, it’s important have it thoroughly inspected and adjusted annually by a trained HVAC professional, such as those at authorized Carrier dealers. It’s also important for the homeowner to continue to replace the furnace air filter every one to three months as needed during cold weather with a quality air filter. To find a qualified HVAC service technician in your area, go the Carrier website and click on Find a Dealer. There are over 300,000 house fires each year in the United States, which is why it is so important to have both smoke and carbon monoxide alarms located throughout your home and to replace the batteries on the detectors regularly. It’s also important to keep a multipurpose (ABC type) fire extinguisher on hand, especially in the kitchen where most home fires start. Fall is also a good time to have your fireplace and chimney inspected by a certified chimney sweep to make sure it’s drawing properly and that creosote hasn’t built up to dangerous levels, which can cause a chimney fire. Electrical problems are another major cause of fires in homes. Electrical fires result in over 50,000 house fires a year, causing nearly 500 deaths and over 1,400 injuries. Shorts in wiring inside walls, on extension cords, in lamps, or from appliances can result in “arc-faults” that can generate temperatures up to 10,000° F. Arc-faults are the main electrical failure that results in fire, according to the National Fire Protection Association. 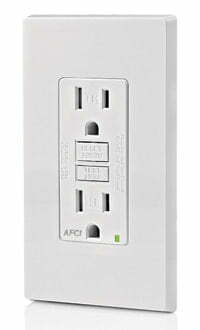 Replacing existing electrical wall outlets with Arc Fault Circuit Interrupters (AFCI), such as SmartlockPro® Outlet Branch Circuit AFCI Devices from Leviton, can detect arc-faults and then interrupt the power to help prevent electrical fires in your home. Go to the Leviton website to find out more about SmartlockPro® Outlet Branch Circuit AFCI Devices. Watch Fall Maintenance Tips for Smart Homeowners to find out more. I really like you tips on draft proofing. I would also make sure to check the attic, basement, roof, exterior facade, windows and doors to make sure these areas are properly sealed as well. Your tips will not only improve home efficiency but I think it will improve a home’s condition. Little improvements and house maintenance as well as organization go a long way. Those draft seals look like shoes for a door. I wonder exactly everything they can help with. Are those able to help stop bugs from entering as well as drafts? In addition to whatever volume controls you may have on your computer or other device, there is a volume adjustment on the video player control bar on the right side. When you move your mouse over the video screen, the control bar will show up at the bottom. The volume is preset in the middle range, to turn it up, drag the dot to the right with your mouse. Hope that helps, and glad to hear you enjoy our videos! Your videos are very good. I wish there could be higher volume. . those of us with hearing problems can barely hear some of them.